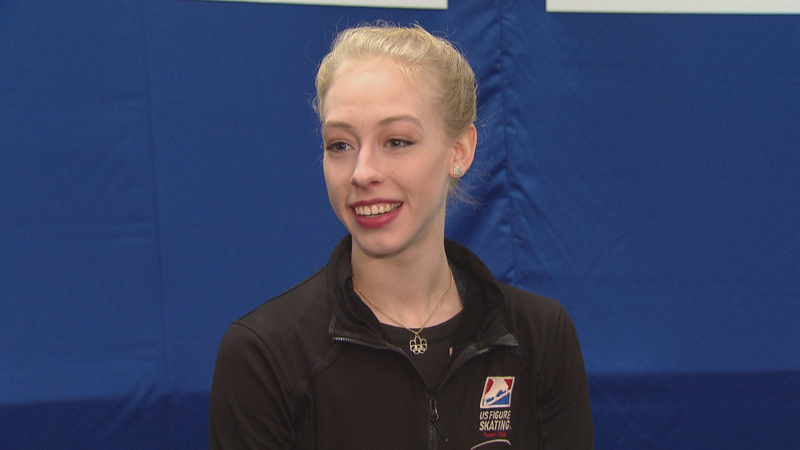 Even though all eyes are on her, 19-year-old figure skater Bradie Tennell may seem shy. But what she does have to say, she says on the ice. And what she said a few weeks ago at the U.S. Figure Skating Championships was, I’m going to the Olympics. It was her performance Jan. 5 in San Jose, California, that earned Tennell the title of 2018 U.S. champion – and a trip to South Korea for the Winter Olympics. In fact, her score at nationals was high enough to set a new U.S. record. “It kinda feels like a long time coming, just … I’ve been working for it my entire life so it’s really nice to experience it,” she said. Her rise to the top has had its icy patches. A few months after winning the junior gold medal at the 2015 U.S. Figure Skating Championships, she broke her back and spent the summer in a back brace. Though she returned in the late summer of 2015, the injury reoccurred the following year. But it never stopped her. “I really just hung onto the fact I knew it wasn’t a career-ending injury, and people come back from far worse, and I’m not one to shy away from a challenge,” she said. A Carpentersville native, Tennell practices at the Twin Rinks ice arena In Buffalo Grove – the same place she’s trained for the last 10 years. Like many elite athletes, she started young, at 2 ½ years old. “And I never wanted to stop,” she said. But her coach Denise Meyers says it’s more than just time on the ice that makes Tennell a champion. “She has grit, perseverance, and probably … a weakness, if you would call it that, is she is shy. But she’s coming around!” Meyers said. Down the street in Vernon Hills, a future Olympic hopeful spends her days in the rink as well. Several years ago, 14-year-old Samantha Liker of Northbrook convinced her parents to let her start skating full time, and go to school online from home. “I was begging my mom and dad to let me try, so I started to improve more and more, so then they would see that I might be meant for online schooling,” Liker said. Like Tennell, her hard work is paying off with a regional championship win. “I set a really high record for my programs and how much I got, like the points that I got on them were very good. I think it was one of the highest ever in my level, so I was really happy with that,” she said. Liker’s day starts at the rink around 8:30 a.m. Between warm-ups, ice-time, stretching and more physical training at the gym, it’s a long day. “That dedication pays off, and Samantha is really dedicated. What’s very important in a sport like figure skating, everything comes down to 2 minutes that you perform on the ice,” her father, Steve Liker, said. He recognizes the sacrifice that she’s making at such a young age. “Every time there’s a prom or a dance, it usually happens around the competition season, so even if she was in school, unfortunately she would have to miss that. So, this is kind of a trade off, but she seems to be OK with that,” he said. The risks, they say, are worth the reward. Her coach says Liker is a natural talent, and since going full time, she’s made leaps forward. “When I say she’s improved, I do not mean just like one quality, like jumps or spins, it is the package, it is skating skills: jumps, spins and the presentation of the whole program, and then the ability to compete,” said coach Alexander Vedenin. She hopes to one day join Team USA as well. Meanwhile, for this Olympic competition, Tennell and her team are fine-tuning the details of her performance on the ice before heading to South Korea. And though a gold medal would be nice, Tennell is just focusing on the process – and not the pressure. Note: This story first aired on “Chicago Tonight” on Jan. 25. It has been updated. Tennell’s next Olympic competition is the Ladies’ Singles Short Program on Feb. 21. Jan. 25: Nearly seven years after former Chicago Bears safety Dave Duerson took his own life, a bill bearing his name will aim to prevent the disease that is believed to have led to his suicide. Jan. 12: Don’t let frigid weather derail your outdoor exercise routine. With the proper precautions and gear, you can keep it up all winter long, says orthopedic surgeon Dr. Diego Villacis. July 20, 2016: The torch will be lit in Rio de Janeiro, Brazil, for the 2016 Summer Olympics in a little over two weeks. Meet some of the Chicago-area athletes representing Team USA.